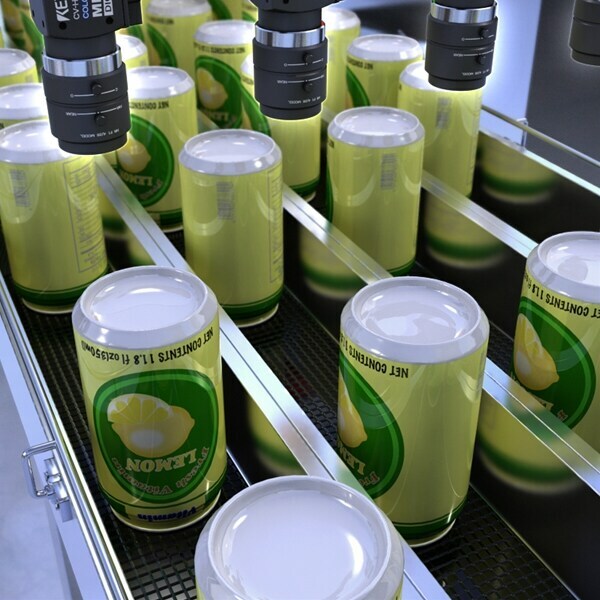 The vision system inspects foreign particles/stains on the bottom of cans. The XG Series Real-Time Shade Correction filter is a preprocessing tool that creates an estimated background of the target and compares it to the input image in real time. Foreign particles and flaws are then isolated and extracted accurately. Flaws were previously inspected using the stain tool, but reflections caused by variations in the curved surfaces made the inspection unstable. The XG Series Real-Time Shade Correction filter removes glare and other surface conditions to stably extract flaws.